Our Sunday quads continue to grow both in size and diversity in rating. Today's quads ranged from first time players to high experts. In quad one it was Bryan Weisz and Alex Eydelman who tied for first place with 2/3 each. 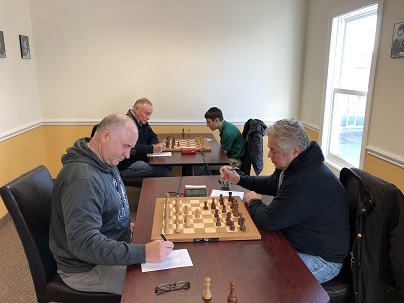 After a 17 year hiatus Craig Moffitt returned to tournament chess to win his quad with a perfect 3/3 score! Quad three saw a tie between James Weisz and Sahil Vora. The two players drew their final round encounter. 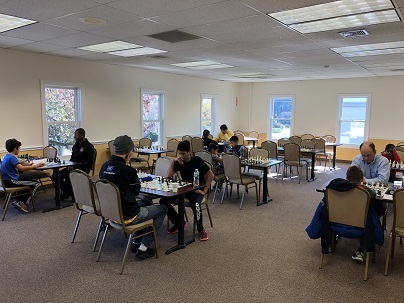 The fourth quad saw two new players to tournament chess. The eventual winner was Dr. Xinghua Wang, who finished with a perfect 3/3 score. Congratulations to all of this weekend's winners!